SEOUL/PAJU -- A 24-member North Korean delegation to the PyeongChang Winter Paralympics crossed the border into the South on Wednesday, according to pool reporters. The delegation, including sit-skiers Kim Jong-hyon and Ma Yu-chol, who will compete in Para Nordic skiing events at a wildcard invitation, will join the Paralympics which start Friday. They will return home on March 15. "I am pleased," Hwang Chung-song, a senior official at the Committee for the Peaceful Reunification of the Country, said tersely when asked by pool reporters about his feelings as he and other delegation members crossed the land border to the South. He was the North Korean representative when the two Koreas held a working-level meeting last month to negotiate the North's participation in the PyeongChang Winter Paralympic Games. Other delegation members did not respond to questions about their feelings about the South Korean trip, but looked relaxed, pool reporters said. Aboard sedans and a travel bus prepared by the South Korean government at the border area, they departed to PyeongChang. The North's first-ever participation in a Winter Paralympic Games comes one day after South and North Korea unveiled a landmark agreement to ease tensions on the Korean Peninsula. North Korean leader Kim Jong-un and a South Korean delegation led by chief presidential security adviser, Chung Eui-yong, agreed to hold a summit meeting between the leaders of the two Koreas in late April and establish a hotline between them. The North also expressed willingness to suspend weapons tests and discuss denuclearization with Washington. 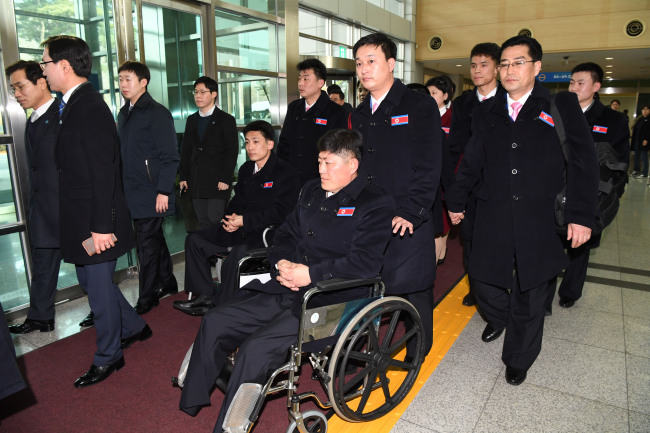 Jong Hyon, a vice chairman of the central committee of the Korean Federation for the Protection of the Disabled, is leading a 20-member athletic delegation that includes six athletes. Kim Mun-chol, chairman of the same federation, represents a four-member delegation of the National Paralympic Committee.